GIVE YOUR HOME AN INCREDIBLE GIFT THIS YEAR! Adding new doors, windows, fascia and soffits or flat roofing would be a great gift for your home. 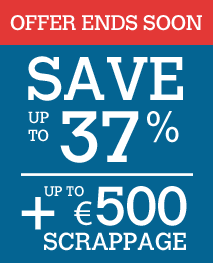 Order now to get up to 37% off your order price! Give your home the gift its been waiting for - order today and enjoy the benefits for years to come. 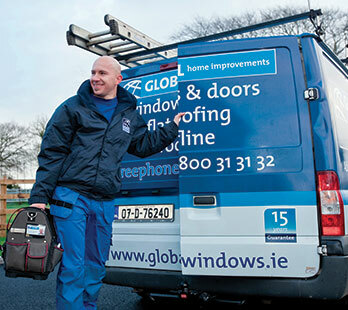 As Ireland’s leading home improvement company Global has achieved a number of awards and accreditations over the years. Global Home Improvements has enjoyed an association with The Q Mark that stretches back to 1993 which demonstrates our commitment to quality. The Q Mark is indelibly associated with quality and excellence in the minds of Irish consumers and is the only system which monitors 100% of a business’ processes and procedures 100% of the time. It is a business excellence framework that reviews all aspects of an organisation on an annual basis in line with the Q Mark for Quality Management Systems framework criteria. Global Home Improvements was named as the Best Home Improvements Company in Ireland at the 2014 National Q Mark Awards and the Best Home Improvements Company in Ireland for Quality Management systems in 2015. Winning these awards has shown that Global truly cares about our customers and we are willing to go the extra mile to ensure that we achieve the highest possible standards at all times. The Agrément Certificates they publish are in accordance with the Irish Building Regulations and the rules of the European Union of Agrément Institutes for Construction (UEAtc). The OHSAS 18001 standard is internationally accepted as a method of assessing and auditing occupational health and safety (OH&S) management systems. In the past, OH&S management tended to focus on the question of how to react to work-related incidents. In contrast, OHSAS 18001 sets out a preventative and proactive approach which involves identifying workplace hazards and assessing and controlling risk. Achieving a structured health and safety management system demonstrates our commitment to the welfare of our staff and customers. if stipulated in the directive, had it examined by an independent conformity assessment body. Our windows have an A+ energy rating awarded by the BFRC. The BFRC is the UK’s national system for rating the energy efficiency of windows, using a consumer-friendly traffic-light style A-E ratings guide. The guide can be used to help consumers to make more informed choices about the energy efficiency of the windows they are looking to buy. The energy rating eg. -3kWh/(m²·y) in this example the product will lose 3 kilowatt hours per square metre per year. Companies saying how good they are? The consumer wonders at times is it true? Commitment to quality and excellence reaps rewards...it's no coincidence that Global Home Improvements has won the award for the Best Home Improvements Company in Ireland. Voted Best Home Improvements Company in Ireland for the second year in a row! At Global we cannot stress highly enough the emphasis we put on quality of our work and service. That's why we firmly believe that companies should be independently assessed to audit their standards and performance. Global Home Improvements have been audited by the Irish Quality Association and been awarded the Q Mark every year since 1992. But we were not happy just with the Q Mark, we wanted to be the best company in the industry for customer satisfaction and quality standard. In 2013 we made it to the finals of the annual Q Mark awards and in 2014 we were voted the Best Home Improvements Company in Ireland. In 2015 we have been named as the Best Home Improvements Company in Ireland for Quality Management systems again. Hailed as “The Custodians of Business Excellence” we were so proud to be awarded this title for the second year in a row! The Q Mark Awards are forever associated with Quality and Excellence in the minds of Irish consumers and is the only system which allows businesses to monitor 100% of their processes and procedures 100% of the time. Winning this award has shown Global Home Improvements truly cares about its customers and is willing to go the extra mile to ensure that it achieves the highest possible standards at all times. “At the heart of our jobs plan we are supporting Irish businesses providing products and services to the highest international standards and creating good, sustainable employment. It is impressive to see tonight, so many Irish businesses from all sectors and counties embedding quality standards as a key part of their offering to customers. These are the innovative Irish businesses that are powering the engine of our recovery, and I wish them every success in the future”. 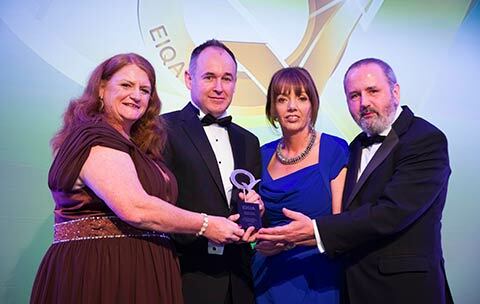 Known as The Oscars of Business Excellence, The Q Mark Award is the highest accolade an Irish business can achieve, given both the intense competition and the exacting standards required. Global Home Improvements can now relax in the knowledge that we are officially the Best in Irish Home Improvement for Quality Management Systems. “Standing still wasn’t an option for Barry, Liam and the team in Global Home Improvements. Defending a title is often harder than winning one for the 1st time! A fantastic achievement”. We will strive to ensure that our commitment to quality and excellence remains unparalleled. At Global, if anything goes wrong it is our problem and not yours. Free 15 year guarantee covers parts, material, labour, travel and construction and free 10 year security guarantee covering replacement of your window or door. When we say free guarantee, we mean it. Some people don’t want you to know the details of their guarantee but we do. At Global you get everything free which means if anything goes wrong with your product or installation, even moving parts, it is our problem and not yours. It will be at our expense, not yours and if you have an emergency during the weekend or night-time, we are available 24/7. We believe a restricted or chargeable guarantee is a cover up for cheap materials and bad workmanship. That’s why we say the cost of the product is every bit as important as the price. In other words it helps to take a long term view of your investment because all windows and doors are not the same. We are proud to stand over the quality of our materials and workmanship by offering you the following guarantees. No other company in Ireland offers these guarantees. Of course guarantees are not much good if you can only avail of them between the hours of 9am - 5pm, Monday - Friday. With the Global 365 service we are available to look after you at weekends, night-time and bank holidays if you have an emergency problem. We are the only company in Ireland offering everything free with our guarantees. Global’s award winning customer service is based on the need to deliver on promises made. 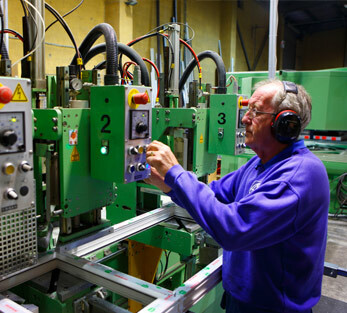 We have the proven history of delivering quality products to our customers on time, every time. That's why we were voted Best Home Improvement Company in Ireland. Why choose Global Home Improvements? When you’re looking at making improvements to your home, it’s imperative that you choose a company that gives you factual information to start with and has a solid track record of doing quality work with back up service when you need it. Here at Global we have the proven history of delivering quality products to our customers on time, every time. We don’t claim to be the cheapest but we are competitive for what we give you. Global’s award winning customer service is recognised by homeowners throughout Dublin and surrounding counties. 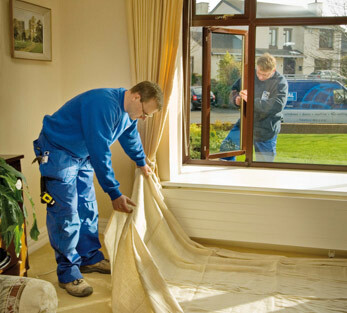 We are the longest established home improvements company in Ireland. A family owned, family run business which understands customer service and the need to deliver on promises made. Because we make our own windows and doors, we are free to source the best materials available. We plan for the long term which means that we don’t take shortcuts to achieve lower prices and we strive to be the very best. We have competent and dedicated installers, many of whom have been with us for a long time. The same meticulous care which applies to the manufacturing also applies when the installation team arrive to fit your new windows. All our installers are employed directly by the company - we don’t use subcontractors. Over 97% of our customers are satisfied with Global and would recommend us to their friends and family and 45% of our sales come from existing customers returning to buy more home improvement products from us. For years we have claimed to have the best products for security and energy efficiency and the best customer service in the country. We are now delighted to say that we were voted Best Home Improvement Company in Ireland by the Irish Quality Association. No other company comes close to us. For the past number of years we have been installing triple glazing as standard with the highest A+ rating available adding more security to your home as well as reducing your fuel bills. Our installers are employed directly by Global, we don’t use subcontractors. 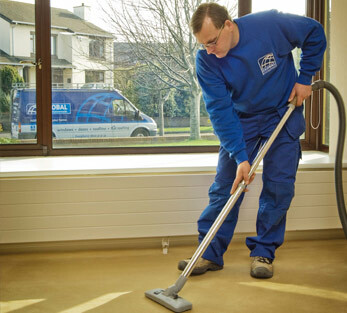 Our staff are highly trained and experienced in what they do. After 39 years of improving customers’ homes, we appreciate the importance of completing the installation with the utmost care and attention to detail. No other company throughout Ireland offers guarantees like Global. Most companies have hidden charges in their guarantees but not Global. Everything is free - no material charges, no labour charges, no travel charges, no call out charges. Free means free with Global. We also offer a free 10 year security guarantee and our Global 365 emergency service is available 24/7 every week of the year. In the event of an emergency, call Global on 1800 313132 and we will be with you within a couple of hours. We’re on call 24 hours a day, 7 days a week, 365 days a year. If within 7 days of placing your order, you find a lower price for products designed and made to the same specifications and with the same guarantees, Global will refund the difference. 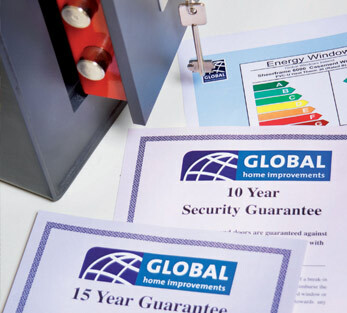 Global are an award winning home improvements company. For the past 39 years Global has been providing the widest choice of maintenance free windows, doors, roofline, flat roofing, attic insulation and conservatory tiled roofs. Global Home Improvements is an award winning home improvements company founded in 1980. For the past 39 years Global has been providing Dublin and the surrounding counties with a combination of high quality craftsmanship and the latest innovations in home improvement products. Underpinned by quality and customer service, we are dedicated to the highest standards of professionalism from recommending the right products for your home to manufacturing and installing the widest choice of maintenance free windows, doors, roofline, flat roofing, attic insulation and conservatory tiled roofs. 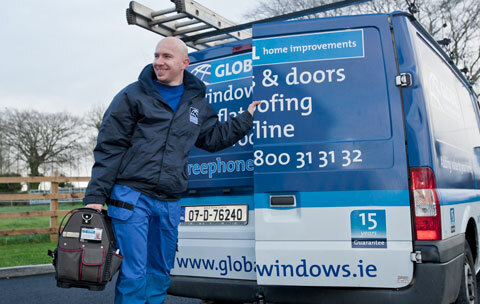 Global has become a market leader and has been recognised among home owners in Ireland as the place to go for high quality home improvements. As a result the company attracts a high volume of repeat and referral business accounting for over 60% of our total sales. 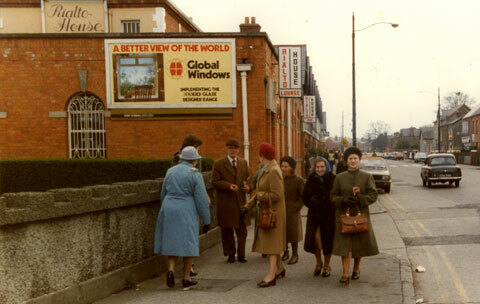 Global is an Irish family owned business and was founded by Tom Shevlin in 1980, originally manufacturing and installing windows and doors. 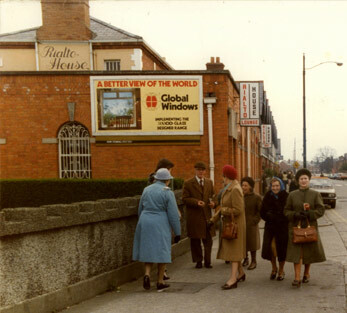 In later years we diversified into other home improvement products and as a result the name was changed from Global Windows to Global Home Improvements to represent the wide range of products and services the company now offers. We have a dedicated team across the business who work each day to provide our customers with the quality products and exceptional customer service that allows Global to stand out from other companies in our industry. We have our own in-house technical team who ensures our designs, specifications and compliance with regulations are up to the highest standard and fit for purpose. They in turn are backed up by our consultant team of architects, engineers and quantity surveyors. The company is headed up by Managing Director Barry Shevlin who has gained invaluable experience throughout the company over the past 17 years. 1982 We were the first company in Ireland to introduce a totally free 10 year guarantee covering parts, labour and materials. 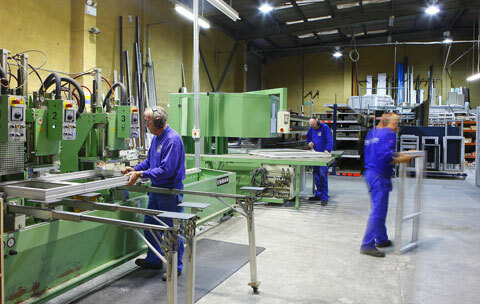 1988 We started to manufacture PVCu windows and doors as well as aluminium. 1990 We designed, manufactured and installed a bespoke range of PVCu conservatories exclusive to Global. 1992 We were the first company in Dublin to be awarded the QMark. 1994 First company in Dublin to be awarded the Agrément certification for product standards. 1995 We developed in-house the first innovative roofline system in Ireland. Our roofline, fascia and soffit system cover all work required between the walls and roof of your home. 1996 We commissioned the Michael Smurfit School of Business to carry out a comprehensive survey of our customers in order to get real feedback and help us to improve our standards and services. 1997 We introduced to Ireland the first PVC flat roofing system for the Irish home owner. 1998 Low letter boxes in doors were becoming a major problem for postmen. In partnership with An Post and UCD we sponsored a competition for students of architecture to design a new type of letter box. 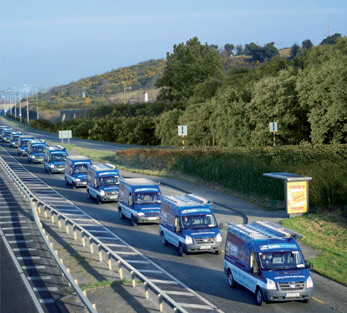 1999 We created history by being the first company in Ireland to accept the Euro. 2000 We were asked by the E.S.B. International to assist the Ukraine government in setting up a PVCu window facility in the Ukraine. 2003 Global were the first home improvement company in Ireland and the United Kingdom to achieve the European Safety Standard Certificate OHSAS 18001. 2003 So successful was our 10 year guarantee, with excellent feedback from our customers, we decided to extend it to a 15 year guarantee. 2005 We then introduced a 10 year security guarantee as a result of the high quality security system on our windows and doors. No other company in Ireland offered a real security guarantee. 2006 First company to achieve an A+ rating on our windows. 2007 Most guarantees in the industry cover service from 9-5pm Monday to Friday – we introduced Global 365 which means our service is running 24/7. Again, another first for Global. 2010 We were the first company in Ireland to install triple glazed windows and doors as standard. 2011 We launched our VENTHERM 20 Attic Insulation with a built in ventilation system. 2012 We designed a new tiled conservatory roof for home owners considering replacing their existing glass roof. 2013 We were finalists at the 2013 QMark Awards. 2014 We were very proud to have been voted Best Home Improvements Company in Ireland at the 2014 QMark Awards. 2015 We are delighted to have been named as the Best Home Improvements Company in Ireland for Quality Management systems at the 2015 QMark Awards. 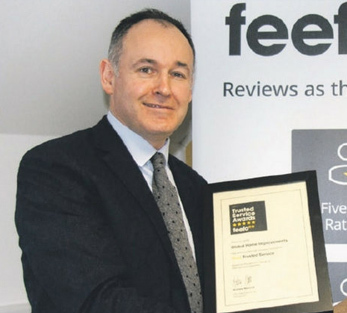 2017 Another First for Global - Awarded prestigious Feefo worldwide customer service award. Stay in touch with Global Home Improvements & get notified about any updates or promotions by joining our newsletter program.